- OfficeMax has joined a growing list of marketers who have boycotted the Michael Savage nationally syndicated radio show because of his anti-Muslin views. - The annoyingly alluring "Kid Nation" along with "Criminal Minds" and "CSI:NY" have awarded Wednesdays to CBS during November sweeps. - If you want some truthful, unabashed insight into the Ad Age IDEA conference, George Parker shares his delightfully witty and wry take on the event. Hey, Jonah, why wasn't I invited? George and I together...now that's what you really want! - Who even knew they had a Dallas office? No matter, Agency.com is closing their outpost there just like practically very other agency that used to be there. 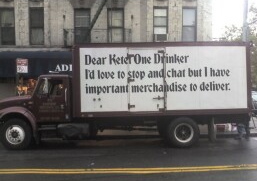 - The Ketel One vodka campaign has now emblazoned the sides of trucks.